What do Lost, Star Trek, The Incredibles, Ratatouille, and Up have in common? If you said that they are all a nice thing to watch for a great time, you would be correct. One of the reasons they are that great is the music playing with the footage – music that can make you laugh, smile, or even cry. Composer Michael Giacchino is the genius behind the curtain on those films and his music is currently playing with Super 8. In a few weeks, his music will grace movie theaters around the world when Cars 2 debuts. However, the original soundtrack will be released a week before the film and is now available for pre-order. While the soundtrack will be available for purchase in disc format as well, those who have become accustomed to purchasing through online music stores can do so through Amazon and iTunes. Both have complete track listings, which I have not listed here as some of their titles contain spoilers. The 26 tracks also can be previewed (up to 90-seconds on iTunes and 30-seconds on Amazon), and we can tell that there will definitely be a hummable theme coming out of this film. I recently had the chance to speak with composer Michael Giacchino about his work on Cars 2, Lost, and The Incredibles. You can read the interview here. BURBANK, Calif. (May 11, 2011) – Fully loaded with global locales, fast-paced racing, international espionage and a touching tale of friendship, “Cars 2” also features an amped up score by Oscar® and GRAMMY®-winning composer Michael Giacchino, plus music from GRAMMY®-winning alternative rockers Weezer, country music hitmaker Brad Paisley, bestselling British singer/songwriter Robbie Williams, French superstar Bénabar and the power pop Japanese girl band Perfume. The international lineup puts the tune in tune-up as the “Cars” characters hit the road on a worldwide tour full of epic adventure. Giacchino also wrote a French song called “Mon coeur fait vroum,” (“My Heart Goes Vroom”) which is sung for the film by the popular and admired French singer/songwriter Bénabar, providing a musical introduction to Paris. The lyrics for the song are by Giacchino and Scott Langteau with French adaptation by Boualem Lamhene. Bénabar’s self-titled album, released in 2001, launched a phenomenally successful singing career. In 2006, his album, “Reprise de Negociations,” was a top seller in Europe, and led to several major music industry awards the following year. Providing their own unique take on the 1984 pop hit, “You Might Think” (written by Ric Ocasek and originally performed by The Cars) is the chart-topping, multi-platinum-selling American alternative rock band Weezer. Weezer burst on the scene in 1992, and has produced nine albums to date. “The song is going to play in the scene where Lightning McQueen and Mater go to Japan,” says Weezer’s Brian Bell, “which is great for us because it sort of mirrors our experiences in Japan—there was a little bit of culture shock. Japanese girl band Perfume’s hit single “Polyrhythm” will also be featured in the film when Lightning and Mater attend the World Grand Prix opening night gala in Tokyo. 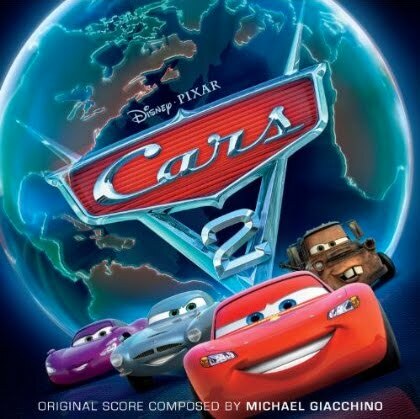 “Cars 2”—the music and the movie—races into theaters on June 24, 2011. The soundtrack from Walt Disney Records will be available June 14.